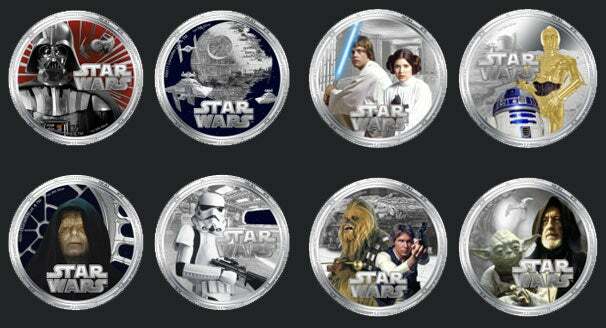 The New Zealand Mint has taken one innovative step to saving the economy--and the galaxy!--by introducing a new line of coins that feature an assortment of Star Wars characters. This unique coin collection has such Star Wars favorites as Darth Vader, R2-D2 and Han Solo adorned on them, and would no doubt garner serious geek-cred in any wallet. The Star Wars coins hold a value of two New Zealand dollars each, and they are legal tender, meaning you could go buy a replica lightsabre with your coinage. Not only that but these coins are probably the only place where you will ever see the Dark Lord himself just a flip away from Queen Elizabeth II, whose on the other side. Sadly the coins are not accepted in galaxies far, far away, and are only valid for spending on Niue Island. However, limited spending power aside, if you want to get hold of them you can come November. A mintage of 7,500 of each coin design will be available in different sets. See the New Zealand Mint site for full details.